Less sugar, more delicious. That's two good to be true, right? Nope. 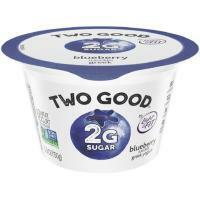 Two Good Greek yogurt has 85% less sugar than average yogurts because it's made with a unique slow straining process that removes sugar from the milk, leaving 2g of total sugar in each 5.3oz cup.